This Saturday brought a plethora of QSO parties. New Mexico was partying, Georgia was partying, and the QRP-ARCI was partying. I was able to spend exactly one hour on Saturday morning, before family obligations kicked in, on the air. The first contact I made was about 10:30AM and it was with James Lee NK7B of St. Paul Minnesota. A new state for the 2018 WAS effort! James is a doctor, actually a retired Professor of Surgery at the University of Minnesota (Go Gophers!) 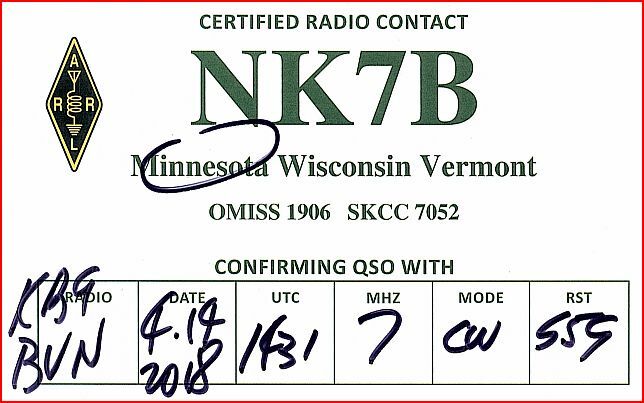 , he has been licensed for 60 years, and is a fan of CW and Elecraft radios. Dr. Lee enjoys putting on a weird suit and then jumping out of perfectly good airplanes. I also was very surprised to get his QSL card in the mail today. His QSL policy is mail his card right after the QSO. Feast your eyes on the card from Minnesota! My second contact was a quick exchange with Tom KA2KGP up in New York. Tom is a very good CW operator. He belongs to SKCC, Flying Pigs QRP, and NAQCC among others. I got a 559 and Tom was worth a 589 from my end. After that I had to QRT and do my family errands and to-do's for the day.